THIS WEEK, in response to the frigid (sub-zero!) temperatures outside, I hoisted the big blue urn off my entrance hall table, and promptly delivered it to Erin Brady. Erin is an award-winning florist. Would you like to see closeups of the soul-warming bouquet she arranged for the hall? 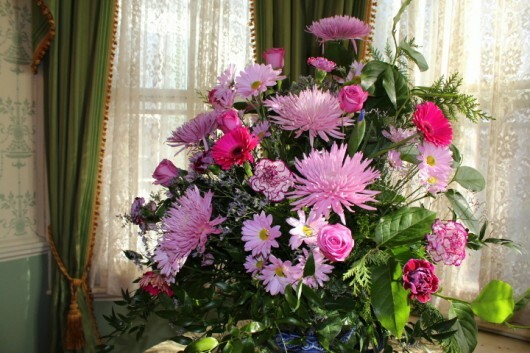 To my eyes, this scented sonnet of pink, purple and blue looks well against the green and gold window hangings in the hall. I think the blue and white porcelain urn — a dear friend for the past 20 years — loves the arrangement as much as I do. 1. Add one 1/4 teaspoon of bleach per quart of water to the vase. Bleach kills the bacteria that causes premature wilting. 2. Aim for cool temperatures. 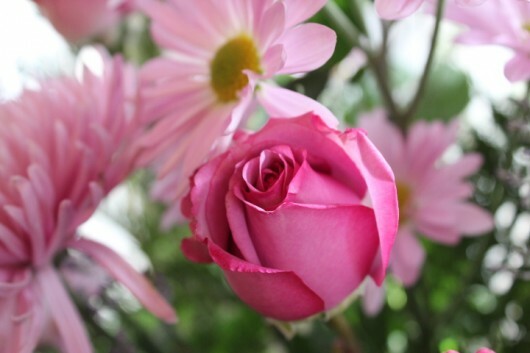 Remember that florists store their most fragile flowers — roses, irises, delphinium, etc. — under humid refrigeration. Consequently, to get the biggest bang from your cut-flower buck, locate your arrangement away from radiators and other sources of heat. Roses. As I just mentioned, these are pricey. But you can do what I do, and limit yourself to just a few stems. Use other, not-too-expensive flowers and a good deal of greenery to fill in around them. The pink-splashed white ‘Olympia’ carnation is nicely scented, too. Blue Iris. This is extremely-beautiful, hideously-expensive, and sadly short-lived. If you are money-conscious, like me, limit yourself to just 3 stems. Mercifully, Erin Brady selected stems which had not opened yet. This way I can watch the gold-licked, blue petals unfurl over the next 5 days. Spider Mums. These are extremely long-lasting even in a warm environment. While I loathe the common white variety, pastel-pink ‘Anastasia,’ above, always gives me a thrill. Gerbera Daisy. 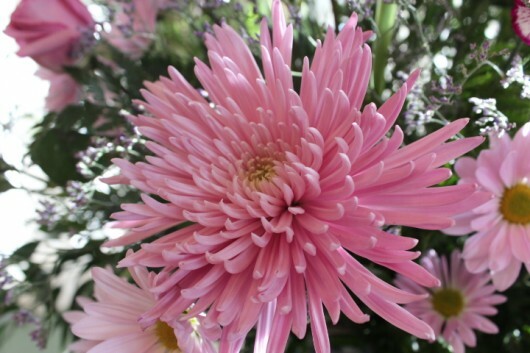 Like spider mums, these are long-lasting, too. I prefer the pastel varieties to the “hot” ones. A hot-hued gerbera looks like an overly-made-up trollop at a debutante’s ball. 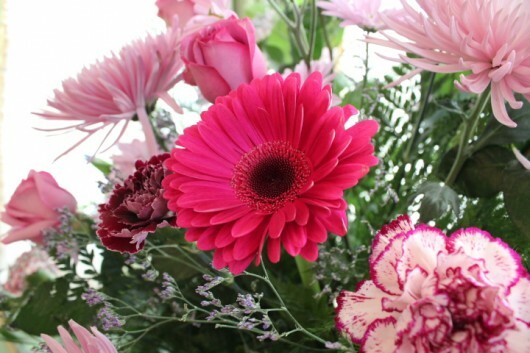 Tip: If you happen to love hot-hued gerbera daisies, kindly ignore my previous sentence. Daisies. ‘Atlantis Pink’ is almost too beautiful, and its vase life in a cool room is a full 10 days. I love it. 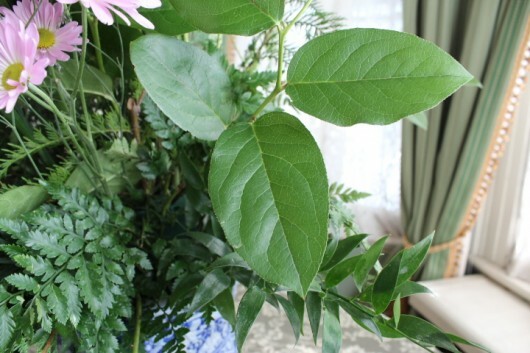 Foreground: Oval-shaped “Lemon Leaf” (Salal tips). Left: Leather-leaf fern; Lower Right: Italian Ruscus. 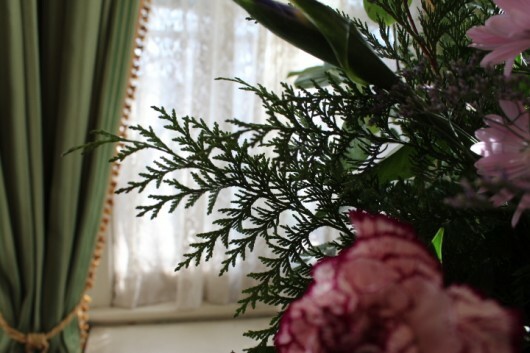 Branches of cedar, included as background, produce a dreamy silhouette when viewed against the lace curtains at the window behind the arrangement. Does the sight of fresh-cut flowers warm your winter-soul, too? You can let me know by leaving a comment. June – I agree. 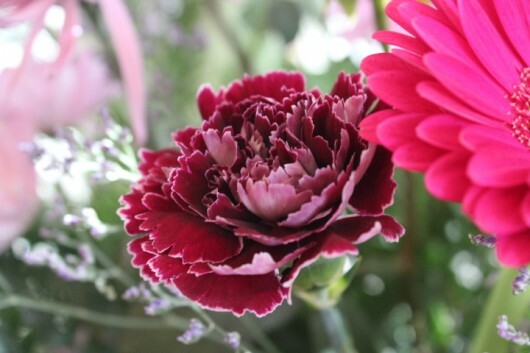 Carnations ROCK. The flowers are beautiful! They definitely sweep the winter doldrums out of any room for a while! Camille doesn’t chew on the flowers? If she ignores them, you are very fortunate. about what is toxic for my “felinus busybodii”. Love the flowers !!! Thanks for sharing during this cold snap. But I love Camille…wondering how Lilly and Camille get along ??? Nothing lifts the spirits like fresh flowers!!! Beautiful. Funny I should find you doing a flower arrangement today. I spent the day taking down the Christmas tree… after which the house looked so drab and lifeless… I had to run out and get some flowers myself. Pale pink ‘Mona Lisa’ lilies for fragrance, burgundy alstroemerias, white spider mums ( yes, I know you loathe them… ), a few stems of hot pink spray roses and several stems of hypericum berries… and a couple bunches of various greens… All arranged in a tall footed crystal vase. 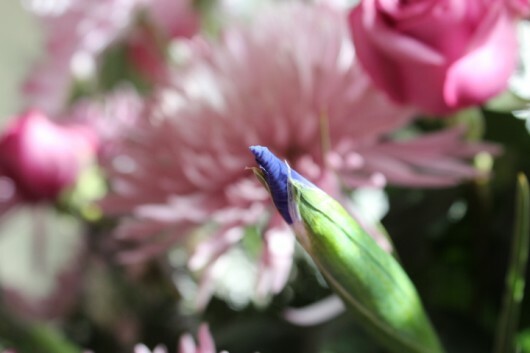 My pet peeve in flower arrangements is baby’s breath… Some florists use it with abandon…. And I have to wonder why. Hideous! Yes, I know… I’m opinionated when it comes to flowers. To those of you who find baby’s breath “attractive”… my apologies. P.S. By the way, I forgot to mention Camille. She’s lovely!! Kevin, I’m so glad you liked the arrangement. Your photos of the piece are beautiful! I would love for you to describe all the arrangements I do, you’re great with words! And thanks for the shout out! 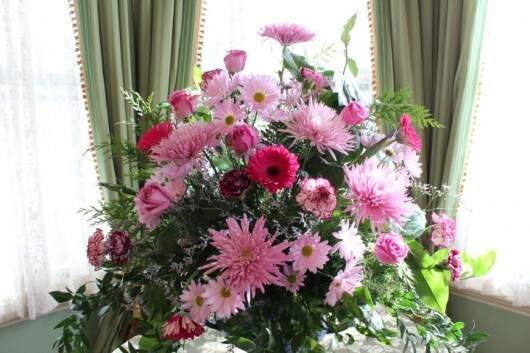 Kevin, I’m not a ‘pink’ person except when it comes to flowers and that arrangement is absolutely gorgeous. What a pick me up in the middle of winter! Of course the picture wouldn’t be complete without the ‘Camille’. 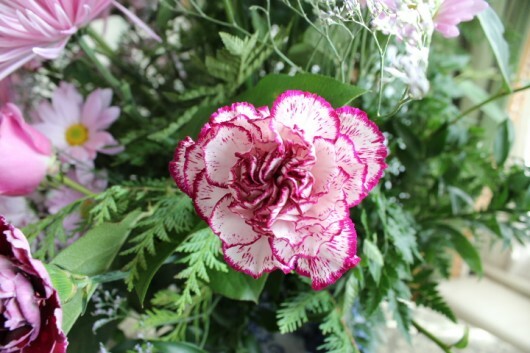 The smell of carnations makes me swoon. Dutch iris are the most gorgeous color on earth. 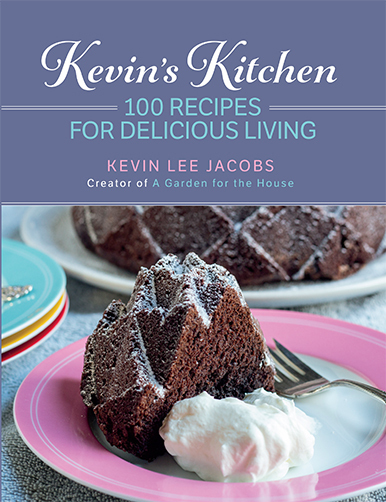 Enjoy your beautiful indoor Springtime, Kevin! So lovely! 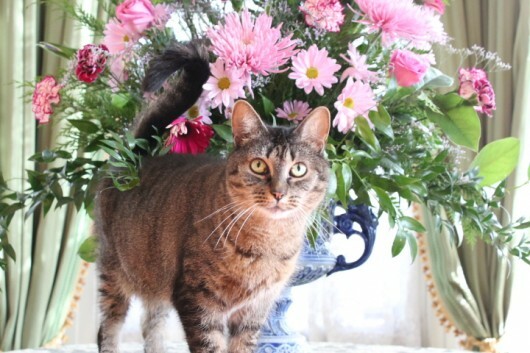 My cats love my flower arrangements,too. Camille looks like our No Se ( no say- Spanish for I don’t know- long story!). I love the spider mums. I have had them, but thought they were dahlias, learned something new! Stay warm, Kevin. It’s been in the 60’s and 70’s here,just north of San Antonio, TX. Not like our Rincón, Puerto Rico winters, but not bad at all! 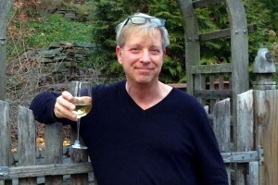 Scott Trudell – Your arrangement sounds terrific. And I’m with you on Baby’s Breath — a little goes a long way. Dennis R – Fortunately, Camille doesn’t eat flowers. She does, however, like to hide behind them, pretending she’s out in the wild. Heather – Cats Tiger and Camille get along fine with Lily. On cold winter nights, they all sleep together on my bed. I would love to see all the steps it takes to make something like that. Please…. The flowers are absolutely beautiful and indeed life your spirits on a cold, dreary winter day! Jude – For a much-too-brief step-by-step, see this ancient post. Thanks for the ‘annotated deconstruction’ of the glorious bouquet! Kevin, this is just gorgeous! I love your Feline Flower!! I too have one, Samson variety, but you have to be careful with Feline Flowers, they tend to take over!! Very pretty! If you want to avoid bleach, about the same amount of hydrogen peroxide has much the same effect on reducing decay in the water in a bouquet and is a little less obnoxious for the environment. 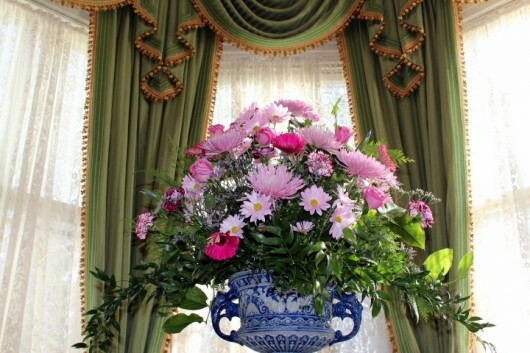 It is splendid; the choice of colors/flowers/greens(and the urn) is perfect. The second photo is award winning for the photographer and the florist. I imagine Renoir would have wanted to paint this masterpiece. Kevin Lee, Your post on face book can make my day. 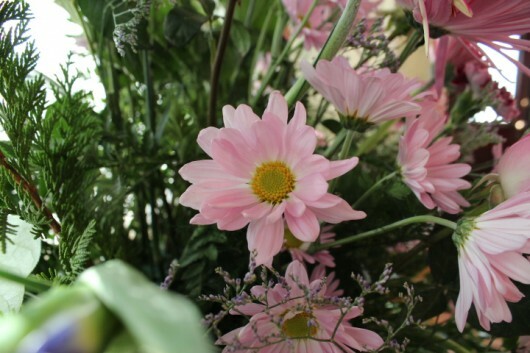 If it is not your receipts – well them – it is your lovely home with flowers that brighten your day and mine, Thank you. I love the Hot Hued Gerbera daisy. Possibly exactly because they look like the “trollop” in your description. So, there you go, insult one of my faves and get a compliment back. Love your blog (is this called a blog?). Keep on keeping on. Camille warmed my heart the most, she is a beauty. A beautiful floral spirits-lifter–thank you. All my favorite colors and flowers. Your post made my Monday morning, including the lovely Camille. PINK!!!!! my favorite color. lovely for sure! You got me with the teaser of the rare “feline” flower. I said to myself, “I never heard of that, let me go see”. LOL know I know I have heard of that and have suspect it’s not quite so rare. Thought you might find it interesting that the German word for carnation and clove is the same: Nelke. Not surprising given the spicy scent. Would have been nice to include a link to Erin Brady’s website.